Join the Jewish Environmental Initiative (a committee of the Jewish Community Relations Council), Missouri Interfaith Power & Light, and the USGBC-Missouri Gateway Chapter for a discussion on how gardens can be used as a tool to care for our planet, help communities in need, and address climate change. The event will feature two keynote speakers followed by a panel discussion. The first keynote speaker is Mike Roberts, former meteorologist for KSDK News Channel 5, multiple Emmy Award winner and adjunct instructor at Saint Louis University in the department of Earth and Atmospheric Sciences. The second keynote speaker, Sylvester Brown, Jr., is a former columnist for the St. Louis Post-Dispatch and current Executive Director of the Sweet Potato Project, a program that teaches at risk youth entrepreneurial skills, including urban farming and marketing skills. The follow-up panel speakers will provide specific suggestions for creating your own native or community garden. They include Dr. KB Frazier of the Cultivating Justice Project, Chris Hartley of the Butterfly House, Kim Reiss of Sugar Creek Gardens, and Matt Schindler of Gateway Greening. The panel discussion will be moderated by Jean Ponzi, Green Resources Manager of the Missouri Botanical Garden’s EarthWays Center. Event co-sponsored by the Jewish Environmental Initiative (a committee of the Jewish Community Relations Council), Missouri Interfaith Power & Light, and USGBC-Missouri Gateway Chapter. Nominations Open for 2017 Board Members! USGBC-Missouri Gateway currently has two (2) Director seats and three (3) Advisor seats open for our board of directors. We are seeking nominations for the 2 Director seats. All terms begin in 2017. Nominations are due by 5 pm Central Time on Friday, August 19, 2016. In 2015, we shifted our board nomination and election process, and no longer hold elections. Nominations are still accepted from the membership. The Governance Committee collects nominations and ensures eligibility of nominees. The committee then consults a matrix of leadership needs to determine a slate to present to the board for approval. The committee expects to present a slate to the board for discussion at the September 2016 board meeting. 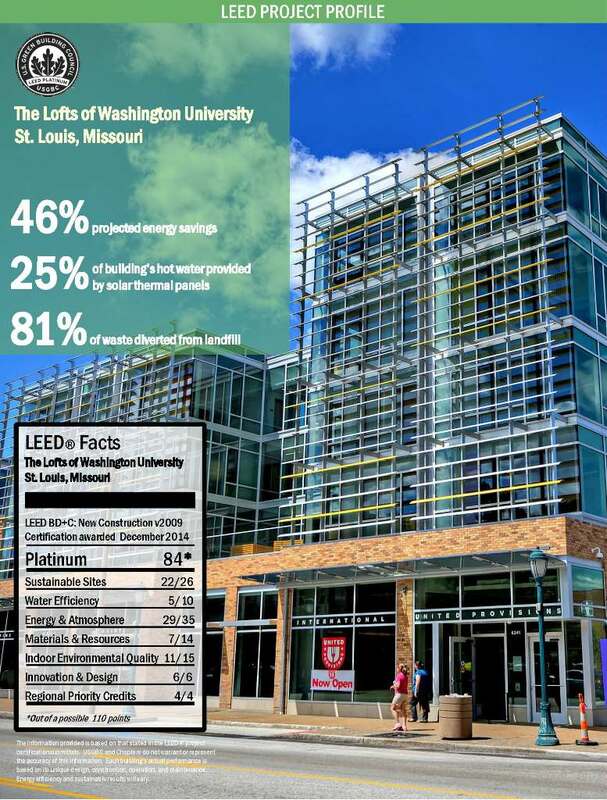 The Lofts of Washington University is the latest LEED project to be featured in a USGBC-Missouri Gateway Chapter LEED Project Profile! The project, located in University City’s Delmar Loop, earned 84 points and received Platinum certification in LEED New Construction BD+C v2009 in December 2014. In addition to providing much-needed student housing for 414 students, the four buildings encompassing the project are a seamless part of the Loop’s busy streetscape. The building houses a 24-hour diner and a grocery store. Many energy and water saving features were incorporated into the project, along with the careful attention paid walkability and access to transit. 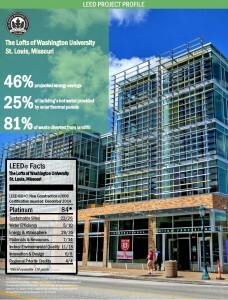 Congrats to Washington University in St. Louis on their first LEED Platinum Project! Learn more by reading the full project profile.